You placed an online order for $70 yesterday and just now, your phone pinged with the satisfying notification that your package has shipped. The bottom of the email includes a tracking link. Knowing full well that the package won’t arrive for at least 48 hours, chances are, you click on it anyway. Why? When you have already ordered and paid for something, it’s just nice to know where it is. It gives you a measure of control, and as a consumer, you have come to expect this level of accountability in any transaction. Now imagine that you are a distributor with 5,000 cylinders in service, with each one costing $200 or so. Let’s do the math: 5,000 cylinders x $200/cylinder = $1,000,000. That’s a million dollars moving around the world unattended. Wouldn’t you want to know where it is? In many cases, the cylinder contents cost a fraction of what the cylinder itself costs, and with increasing steel prices, cylinders and other gas storage systems are becoming even more expensive. So why isn’t everyone tracking? In the early days, many distributors were hesitant to invest in the technology of cylinder tracking. It seemed expensive, confusing and time consuming. They also worried that tracking might uncover issues in their rental business. “Some distributors wrongly assumed that meticulous tracking might reveal that they are overcharging for rentals, when in reality, the complete opposite is true,” said Tim Fusco, CEO and co-founder of asset management company TrackAbout, Inc. In addition to increasing rental income and improving efficiencies, cylinder tracking can also result in better customer service, and in a tight market where you are less able to compete on price, better service can have a big impact on the bottom line. In fact, some customers, such as many universities, now require cylinder tracking in order to secure new contracts. Asset tracking involves the use of a cylinder tag, a reader and tracking software. In the past, handheld readers were expensive and also proprietary, so they weren’t compatible between systems. Today, that is less of an issue. 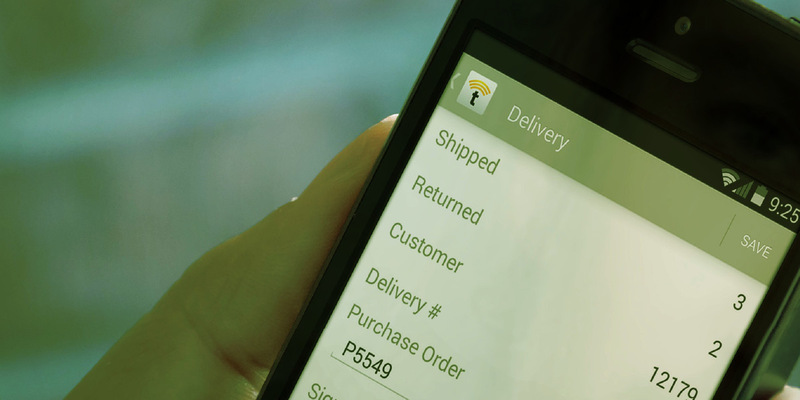 Smartphones and tablets can now be used to read bar codes as quickly as expensive handheld trackers, and the software is user-friendly and can be used for a full range of inventory control, compliance, customer communication and accounting functions. Due to tighter controls on rentals and automation of DOT paperwork and billing, the return on investment is swift and sure. “Tracking streamlines all of your processes and provides an across-the-board improvement to your bottom line,” said Ryan Dunn of Cee Kay Supply. Printing barcode labels (using the cylinder serial number) and then labeling/initializing cylinders occurs as the cylinders are returned for refilling. Professionally printed bar code labels are preferred to ensure quality and avoid printing errors. Smartphones and tablets with asset management software can be used to immediately identify the location of cylinder assets, along with additional information such as frequency of use. This increases accountability in a way that customers appreciate — it identifies cylinders that are not with the customer who is being billed for them or are not in use and should be returned for credit. Administrative efficiencies are also gained because data can be inserted directly into accounting systems and also used to immediately produce required DOT documentation. Distributors today have several options when it comes to tracking large quantities of cylinders, including manual counting by unit size and type, bar coding and radio frequency identification transponder tags. The following table compares the features and benefits of all three methods. In a recent GAWDA Connection Survey, readers were asked what management system they use for cylinder tracking. The majority of companies reported using bar codes, an enormous increase from the previous Welding & Gases Today survey in 2009, when the majority of respondents reported that they still used manual tracking. In a palletized production plant, the filler can scan the bar codes on the pallet and then associate them with a single pallet bar code while waiting for the cylinders to fill. That way, the driver only needs to scan once to register the whole pallet. Hard goods can be bar coded as well, so even before the driver leaves the distribution center, he/she knows, for example, that three cases of welding wire must be loaded and whether that occurred. The scanning software automatically identifies mistakes such as missing scans or duplicate serial numbers. Early bar code labels were easily damaged due to exposure and abrasion. Today’s cylinder bar code stickers are designed specifically for use in harsh environments. Cylinder bar codes are available printed on rugged polyester material or anodized aluminum. The adhesive is designed to permanently bond to metals, plastics and both textured and contoured surfaces. The labels have excellent resistance to chemicals, abrasion and solvents and are designed to withstand extreme cold, heat and UV exposure. Some bar code labels have an expected life of 20 years or more. Passive – A passive tag must be powered up by the transceiver before it can transmit data (it draws power from the radio waves beamed by the reader and reflects them back to the reader). Since the radio waves are reflected, the read range is typically limited to less than 20 feet. Passive tags are small, inexpensive and widely used. However, scanning in a metal environment or near liquids can be an issue. Active – Active RFID tags are larger because they require a power supply or battery. They are always in operation and useful in applications where distance is a factor. Active tags contain their own radio frequency emitter and act as a beacon that can send information to a reader at any time, allowing for unattended tracking of information such as the type of gas, cylinder location and requalification dates. However, the maintenance costs increase due to the power supply, and they are used less frequently than passive devices. Battery-Assisted Passive (BAP) – These devices extend the read range at a lower price point. When the reader sends a signal, it activates the battery in the BAP tag, sending backscatter waves that can be read at longer distances. Tracking systems are linked to web-based and mobile software applications that perform everything from GPS monitoring to accounting functions. This software is available for both Android and iOS operating systems. Telemetry adds another dimension to a cylinder tracking system. These systems are used to collect usage data (such as pressure and liquid levels) at the customer location and transmit it electronically to a distributor to track maintenance and reorders. The system sends an alert to notify users when it is time to change or reorder tanks and also supplies predicted stock depletion dates. In the past, distributors had to travel to multiple locations to monitor pressure and liquid levels, and unexpected usage peaks could result in outages. This was an intensely time-consuming task and resulted in manual input errors, customer discrepancies and emergency gas deliveries at night or on the weekends. Remote telemetry systems were developed to provide continuous monitoring, but early systems required the physical insertion of pressure or liquid level sensors into the tanks, hard wiring and time-consuming pairing between the transmitter and receiver. The systems were so expensive that they were typically only applied to critical installations and bulk tanks. Today, various types of wireless telemetry systems are available, from simple screw-in devices to advanced LED user interfaces. In addition, digitization has resulted in lower prices that have opened the market to continuous monitoring of smaller tanks and even cylinders. Refer to the GAWDA Buyer’s Guide to learn more about these and other GAWDA members who supply tracking, telemetry and software solutions designed for the welding and gases industry.